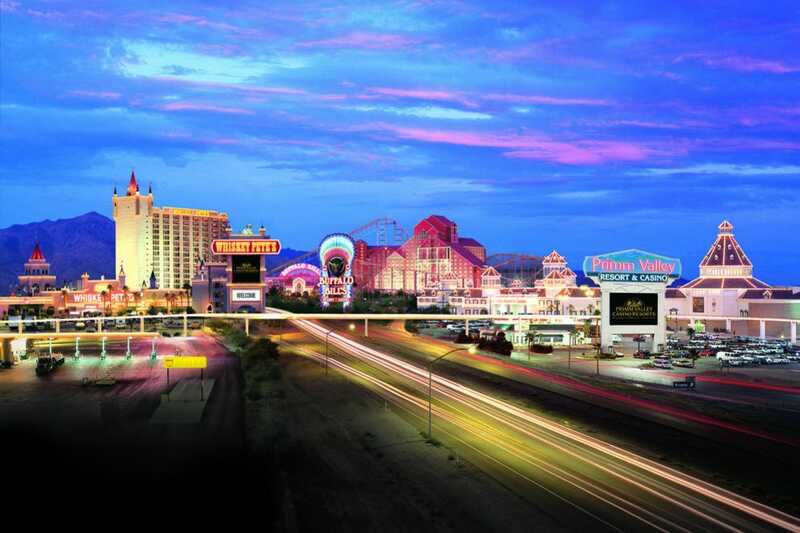 Located 25 minutes south of Las Vegas on Interstate 15, Primm is a popular destination with Las Vegans and Californians alike thanks to its convenient location on the Southern Nevada/California state line. Offering an array of affordable activities, Las Vegans frequent Primm to shop while Californians like to visit for its Vegas-vibe. Primm scores a hole-in-one with golfers thanks to its two Tom Fazio-designed pro-style courses that challenge players while highlighting the desert’s natural beauty. The par-71 Lakes Course offers a lush, 6,945-yard layout with dense groves of tall pines, acres of lakes and river systems and rolling green fairways that seem to go on forever. Meanwhile, the par-72, 7,131-yard Desert Course offers a completely different setting, with desert landscaping, cacti and narrow fairways. Visitors to Primm never have to worry about going hungry. From fine dining to casual fare, there's sure to be something to cure hunger pangs without breaking the bank. Dine at familiar standbys like IHOP or McDonald's (both inside Whiskey Pete's Hotel & Casino) or feast on area favorites like GP’s Steakhouse inside Primm Valley Resort & Casino, serving mouth-watering American and European cuisine in a 1930s country club atmosphere. Las Vegas may be the Entertainment Capital of the World, but Primm gets its fair share of stars, too. In fact, its 6,500-seat Star of the Desert Arena (located at Buffalo Bill’s Resort & Casino) has hosted everyone from Brooks & Dunn to B.B. King over the years. Meanwhile, Primm Valley Resort & Casino’s Bonkerz Comedy Club features some of the funniest names in comedy every Friday and Saturday night–and that’s no joke! Like Las Vegas’ many casino resorts, the comfortably-appointed hotels in Primm offer something for everyone. Spa-goers love The Spa at Primm inside Primm Valley Resort & Casino for its affordable services, while adrenaline junkies rush to Buffalo Bill’s Resort & Casino to plunge 209 feet on its roller coaster, the Desperado. Ranked among the Top 10 coasters in the country by the Travel Channel, it’s one of the tallest and fastest roller coasters in North America! Home to more than 100 designer outlets, the Fashion Outlets of Las Vegas is frequented by Las Vegas locals and tourists alike thanks to its daily shoppers’ shuttle. Pick-up locations include the MGM Grand, the Miracle Mile Shops at Planet Hollywood Resort & Casino, Fashion Show, LVH and Trump. Shoppers can save up to 75% off at such popular stores as Michael Kors and Juicy Couture, making this outlet mall well worth the trip.